Archbishop Christophe Pierre listens as the Gospel is proclaimed at Mass Oct. 26 in Immaculate Conception Chapel at St. Charles Borromeo Seminary. St. Charles Borromeo Seminary, Wynnewood, was host to a distinguished guest on Wednesday, Oct. 26. 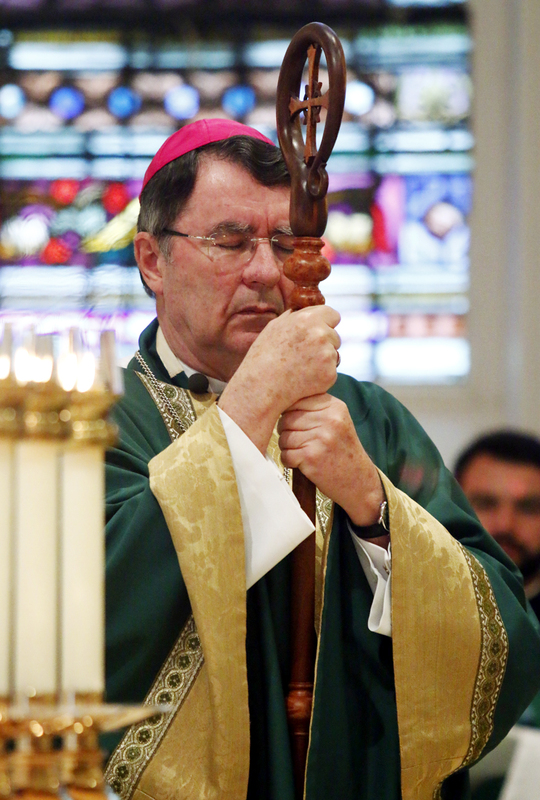 Archbishop Christophe Pierre, who became papal nuncio (the Vatican’s ambassador) to the United States in April, celebrated a 4:30 p.m. Mass in a filled Immaculate Conception Chapel. 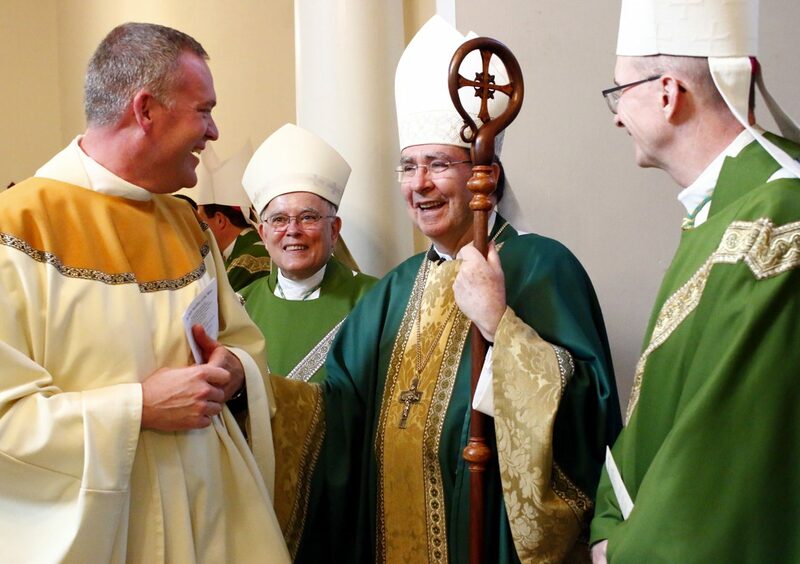 He was joined in the celebration by Archbishop Charles Chaput, Seminary Rector Bishop Timothy Senior, Bishop Michael Fitzgerald, Bishop John McIntyre and a host of Philadelphia priests. Archbishop Pierre, 70, is a native of France whose career has been almost entirely as a Vatican diplomat. More recent assignments were as apostolic nuncio in Haiti, Uganda and Mexico before coming to the United States. In his welcoming words Bishop Senior took note that this was Archbishop Pierre’s first visit to a U.S. seminary and first visit to Philadelphia. “We are so blessed by your presence and it reminds us of the presence of our Holy Father last year,” he said. He spoke too of St. Charles Borromeo, “the great father of the church who was so interested in the spiritual formation of the church.” Just as St. Charles was a voice of renewal in his time, the age of the Reformation, “in these times we must not be afraid of renewal,” Archbishop Pierre said. “Our voices must be prophetic. Our deeds must be filled with compassion. Do not be discouraged in your sincere effort to do good, support one another in the quest,” he advised. “The two takeaways I had,” said seminarian Austin Robuck, who is in the Spirituality Year, “first we need to be generous and joyful in following Christ. If we don’t have that we won’t make a difference. Father Christopher Cooke, who is director for the Spirituality Year at St. Charles, thought Archbishop Pierre’s comments were authentic and really from the heart. “He was encouraging us to persevere and trust in God,” he said. After the Mass Archbishop Pierre’s visit was capped by a festive dinner with Archbishop Chaput and Bishop Senior and his brother bishops along with the faculty, students and other guests.